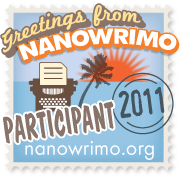 NaNoWriMo is nearly over for this year, and with a current word count of 47,333 and two more days to write, I think I’m going to “win” this year. I am excited because I even went out of town to a conference and managed to keep up OK. I fell behind a little, but I had planned ahead and written a lot so that I would have some padding in case there was time I couldn’t write in Chicago. It was a great trip, by the way. One of the “carrots” for me this year has been the 50% discount on the full version of Scrivener for winners. I can’t see using anything else to write fiction with, and I’m certainly not using MS Word or Apple Pages. Scrivener was designed with writers in mind. I keep forgetting it has templates for nonfiction and academic writing, too. I am happy with most of what I wrote, but I gave myself permission to write stuff I know I’ll need to cut later just to have it down and move on to the next thing. I think it helped that I set the story in a place I know well. Although I did just manage to send my main character to London, she’s spent most of the novel a couple of blocks away from my house. I also didn’t worry a lot about pop culture references. The movie Anonymous and the breakup of Ashton Kutcher and Demi Moore both made it into my book. Hey, if Colin Firth and Hugh Grant can both be mentioned in [amazon_link id=”0753158590″ target=”_blank” ]Bridget Jones’s Diary[/amazon_link], I think I’m OK. Here is to the home stretch. May I have more time to read and thus update this blog on the other side of November. You can totally finish! Yay for you! I love hearing about writing process! Pretty much saw this comment right after I finished, so it must have been you sending me luck.